I went to the library on Sunday and picked up several new books for the kids (and myself, of course). They've really been enjoying When the World Is Ready to Sleep and Mortimer's Christmas Manger, which is one of our own books. Here are some of the other books we've been reading this week. Will You Be My Friend? 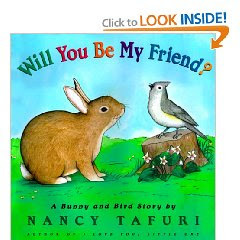 A Bunny and Bird Story by Nancy Tarfuri is a sweet story about a bird and a rabbit that live in the same tree. Bunny wants to be friends with Bird, but Bird is very shy. One day there is a rain storm and Bird is getting very wet, so she finally takes a chance and accepts Bunny's offer to help. It's a sweet story about overcoming shyness, making friends and helping others. The language is very simple - each page has just one short rhyming sentence made up of easy-to-read words. I haven't tried yet, but I'm guessing C, who is in kindergarten, could read most of it. 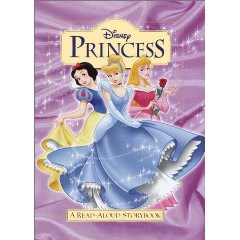 Disney Princess: A Read-Aloud Storybook by Jennifer Liberts Weinberg includes the classic stories of Cinderella, Snow White and Sleeping Beauty. Each story is short enough to keep my 2 year old's attention, but much longer and more detailed than the princess board books she has. They get into the more sinister aspects of the stories, which the board books leave out. But they are still written for young listeners and readers. M loves this book, and I actually think I will buy it for her as I'm sure she'll want to hear the stories of these princesses for many years to come. 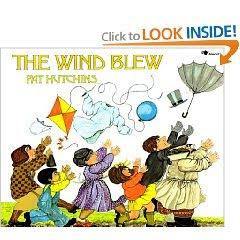 The Wind Blew by Pat Hutchins is a cute story about the wind taking all sorts of items away from their owners and whipping them up into the air until they eventually fall back down again. The illustrations are fun and the story is silly, which makes this an entertaining book. I haven't read other Pat Hutchins books before, but it seems she has quite a following and I expect I'll seek out another of her stories soon. The Best Soccer Player by Susan Blackaby is part of the Read It! Readers Purple Set of books from Picture Window Books. C has read a few of the books at this level of this series, and I brought home a few more from the library last weekend. This is the one he's been reading mostly this week. It's a cute story about Katy, who kicks the ball and scores a goal, making her the best soccer player. But there's a twist at the end. Will you be my friends looks totally sweet. All the books sound great! I know Selena would love the Disney Princess book.